Is Housing the Best Use for this Land? The Upton Farm is a 246-acre property in Charlottetown, PEI. It is bisected by the Trans-Canada Highway and located between the North River Causeway and the Upton Road traffic light. 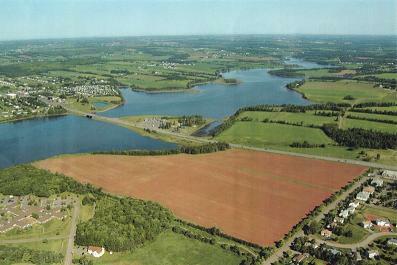 The fields and mixed woods of the Farm start at the Beach Grove Forest Division and run along the shore of the North River to the proposed location of the Charlottetown arterial highway. The aerial photo above gives you a bird’s eye view of this beautiful property. You can see the Trans-Canada Highway in the middle of the picture. 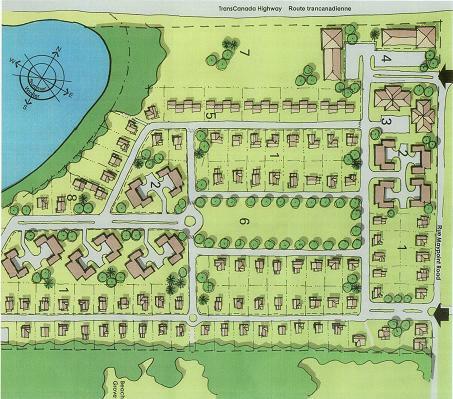 The brown-coloured field to the south of the highway is bordered by Maypoint Road, and it is proposed to build 350 housing units consisting of houses, apartment buildings and town homes here (see the concept plan for the subdivision below). The field to the north of the highway is proposed for business park development. The North River estuary, which runs the length of the Upton Farm property, provides a living for dozens of oyster fishermen who harvest shellfish from its waters.The Upton Farm was once part of the Federal Agricultural Research Farm and was transferred from Agriculture Canada to the Canada Lands Company in 2001. The CLC is a Crown Corporation created to sell surplus government properties “of large value and local prominence” that are no longer required by the Government of Canada. Its mandate is to optimize the financial value of these propertites. All profits made by the CLC on the sale of these properties are returned to the Government of Canada. Our group believes that since this land was bought and paid for once by the taxpayers of Canada it should be left for the people for the people of Canada. It should be remain as greenspace for social and environmental reasons. The recreational value is immeasureable, as are the benefits from an urban forest to aid with air purification.We need to ask ourselves: is housing the best use for this land? Is it imperative to sell public land when there is no clear need? This entry was posted on March 10, 2007 at 5:06 am and is filed under Pictures. You can follow any responses to this entry through the RSS 2.0 feed. You can leave a response, or trackback from your own site. This housing project looks very high density. Is this excatly how it will look. Has anyone thought about the traffic. Where will all the cars go. I thought the downtown area is looking for more people to live there. What about all the vacant subdivisions in West Royalty. This must be a joke. In addition to Infrastructure Canada, I am responsible for the five Crown corporations that contribute to housing and federal land development: Canada Mortgage and Housing Corporation, Canada Lands Company, Vieux Port de Montréal, Downsview Park and Queens Key West Land Corporation. I have a responsibility to ensure that they are aware of the needs and priorities of their sole shareholder: the Government of Canada. And one of those priorities is that that the activities of these Crown corporations at the municipal level must be consistent with both local needs and national interests. Appropriate housing strategies also support broader urban issues and environmental sustainability. If we are not careful, urban sprawl may create a legacy of congestion and gridlock in our major urban areas. The main issue here (IMO) is that this is NOT the best use of this land. While a handful of people (CLC, the developer, the contractor…) would benefit from this plan, the remaining 140,000 people on PEI will be LOSING a priceless asset. There are hundreds of available building lots (273 in Winsloe/West Royalty alone), so it’s certainly not about a housing/land shortage. What is lacking is the vision and foresight to do the right thing…..to leave this land alone so that all citizens of Charlottetown and PEI can enjoy it for generations to come.